and six food and beverage outlets. The signature coral-pink walls of The Vinoy Renaissance St. Petersburg Resort & Golf Club rise seven stories above the waterfront in downtown St. Petersburg, Florida. Built in 1925, the illustrious Mediterranean-revival hotel began its life by hosting wealthy travelers seeking escape from winters up north. Today, the AAA Four Diamond property offers an equally compelling destination year-round, whether for business travelers, vacationers, or groups of up to 1,500 attendees. Waves of renovations preserved the grande dame’s character and charm over the years — while keeping the amenities up to date. Those amenities complement the 362 guest rooms and suites, all with fresh, new looks, state-of-the-art technology, and other Marriott hallmarks. Guests dine at six food and beverage outlets, including Paul’s Landing, a waterfront restaurant that offers locally sourced seafood, indoor and outdoor seating, and wonderful views of Tampa Bay. Groups meet in more than 40,000 square feet of event space, including the meticulously restored Vinoy Grand Ballroom and ultramodern Palm Court Ballroom. For free-time fun, the hotel boasts two pools, a tennis club, a fitness center, a day spa, and a marina. While a shuttle whisks golfers to the 18-hole course on Snell Isle and beach lovers to nearby sand on the gulf, the meetings team customizes sightseeing outings for others. Also available are docent-led tours of the hotel, which has been beloved for 90 years by everyone from Calvin Coolidge to George Clooney. We've held our Investment U event here 5 times now... plus are working on a contract for 2017. Best hotel in the St. Petersburg/Tampa area. Staff is friendly, food is delicious and the rooms have a historic charm. Ideal for weddings. Able to host large conventions. Lots of meeting space contained on 2 floors. Overnight rooms are housed in 2 towers. One tower has the meeting space and the other tower requires a very short walk, but you have to go outside. Even so, I fell in love with this place. Historic, but has a funky vibe. Located in such a safe and charming district. Tons of restaurants, boutiques and incredible art museums just steps away. I was really impressed with downtown St. Petersburg. If your group is into golf, the course is not located on the property. You have to take a shuttle. Beautiful historic hotel in the heart of St. Pete. Great, safe, cool downtown. Walked to several awesome restaurants, boutiques, art galleries, etc. Great dining options in-house too. Meeting space is located on 2 floors. Only 2 drawbacks in my opinion. No fixed registration area and outdoor walk from some of the overnight rooms. Well worth it though. We just completed our annual symposium. First time at this property and our attendees were in awe. The Vinoy is a beautiful resort. The staff is super friendly. They go out of their way to make sure you are comfortable. I met with the banquet staff on a daily basis. They provided daily totals of our expenditures, so it was a great way to ensure we were staying on budget. I rated F&B at an 8 only because there was only one breakfast buffet and the prices for all of the buffets were higher than what we have been paying in the past. But, the food was excellent. Accommodations were rated at an 8 only because there are not dressers in the room, so if more than 2 people stay in your room, you are very limited on where to put things. Also, the bathroom has limited space for storage of any toiletries. Overall it was a fantastic experience and everyone in attendance voted to return to the Vinoy for another event. ST. PETERSBURG, Fla. (November 17, 2016) – As part of its two-year repositioning, the historic Vinoy Renaissance St. Petersburg Resort & Golf Club announced the next phase of its renovation plans, taking place at the main resort. This stage of redevelopment includes enhancements to the resort’s amenities, including the spa, fitness center, tennis courts and dining facilities. Beginning in January 2017, the resort will break ground on its all-new Marina and Pool view restaurant located on the Esplanade deck. This casual-dining restaurant will feature both indoor and outdoor seating with spectacular views of Tampa Bay. Redevelopment will continue with a new parking garage structure. Built in the current location of the tennis courts, the two-story structure will feature enhanced tennis courts on the top level with a new fitness center on level two. While some tennis courts will remain available to resort guests and club members during the renovation, the St. Petersburg Tennis Center has partnered with The Vinoy and will serve as the temporary home for tennis play. Located less than two miles from the resort, the center will accommodate all types of use including lessons and league practice, with six courts dedicated to Vinoy Club Members. In return, The Vinoy is enabling the St. Petersburg Tennis Center to build three courts at their existing facility that the center will have use of indefinitely. The main resort will also receive expanded spa and fitness amenities. In addition to its enhanced tennis facilities, the parking garage structure will also be home to an all-new, 16,500 square foot fitness center. Featuring state-of-the-art equipment, personal training rooms, multi-use rooms and additional locker rooms, the center is set to open in early 2018. In addition, the new, 9,000 square foot spa facility will boast water features and tranquility gardens, an all-new wet area, spa-specific locker rooms, updated treatment and relaxation rooms and ideal accommodations for private parties. The spa is slated to open in late fall of 2018. Originally opened on New Year’s Eve in 1925 and listed on the National Register of Historic Places, The Vinoy Renaissance Resort & Golf Club is the only historic luxury resort on Florida’s west coast that boasts a private 72-slip marina, 18-hole golf course, 12-court tennis complex and 5,000 sq. ft. fitness center. 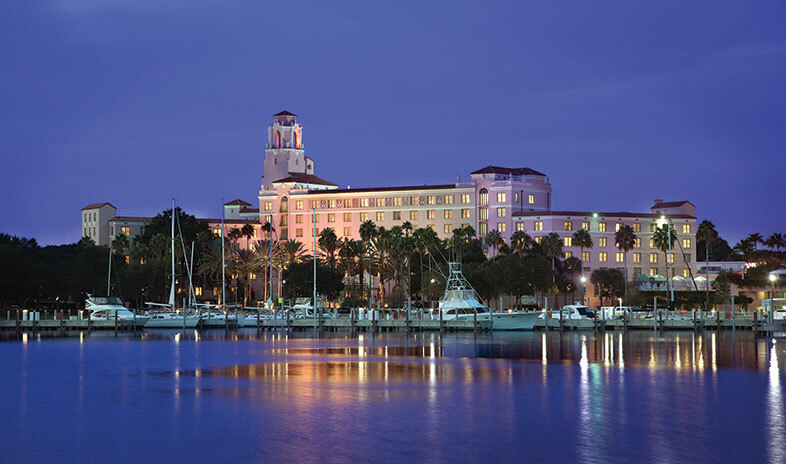 The iconic hotel is ideally situated overlooking Tampa Bay. The lounge-like lobby blends modern elegance with Mediterranean Revival architecture and features custom-made artwork from Dale Chihuly and Renee Dinauer. All 361 guest rooms give the feeling of a personal retreat, and with indoor/outdoor event space, five restaurants and a salon and day spa, the hotel is St. Petersburg’s premier AAA Four-Diamond resort. the senses of our guests, who see their business trip as an exciting opportunity for new, interesting and sharable moments. We offer signature events in our lobbies, bars and lounges designed to showcase emerging talent in music, the arts, mixology, gastronomy and more. Renaissance Navigators are neighborhood experts who are ready to assist guests in discovering true local flavors and activities. R.E.N. Meetings offers groups an experience beyond a traditional meeting, rooted in creative sensory meeting design and custom-curated local Navigator excursions and networking events. At Renaissance Hotels, we strive to ensure that every trip is transformed into an eye-opening, unforgettable journey. To discover more visit www.renhotels.com. For upcoming events visit www.renhotels.com/events. Visit Marriott International, Inc. (NYSE:MAR) for company information. ST. PETERSBURG, Fla. (March 10, 2016) – As a St. Petersburg icon, The Vinoy Renaissance Resort & Golf Club has stood as a pillar of the community since its opening in 1925. Over the next two years, The Vinoy will be ushering in a new level of luxury. Beginning in May, the resort will commence a multi-phased renovation and redevelopment project.  An all-new Clubhouse Grill with a variety of seating options to include covered outdoor dining.  A redesigned and expanded resort-style experience at the Sunset Swimming Pool with cabana lounges and new amenities.  A separate new splash pad and Kids’ Fun Zone, perfectly suited for families.  New food and beverage service conveniently located poolside and also accessible by golfers for grab-and-go snacks while on the course.  New Ladies and Men’s Locker Room featuring fine finishes and elevated décor.  A multi-year plan to improve bunkers, drainage, headwalls, irrigation and general aesthetics on the golf course and practice facility. Throughout this first phase, the scenic greens of the championship Vinoy Golf Course will remain available for Vinoy Club Members and hotel guests to enjoy without interruption. Temporary food and beverage facilities will be offered courtesy of a 1,600 sq./ft. tented structure.  All new “Har Tru” tennis courts.  A new, centrally located Tennis Pro Shop including the addition of an outdoor lounge area.  A significantly expanded fitness center, including state-of-the-art studios and locker rooms.  A spacious and enhanced spa facility featuring updated treatment rooms, lounge areas, wet and dry spas, and dedicated locker rooms.  The replacement of current restaurant Alfrescos with an exciting dining concept with improved marina and park vistas. The new design of The Vinoy Club is intended to honor the timeless heritage of the club and resort, while infusing the advantages of modern design and technology. Inspired interiors will be accented with luxuriant finishes, delivering a completely new look and feel to the property’s unmatched offerings. Renaissance Hotels encourages guests to Live Life to Discover™ at 160 hotels in over 35 countries around the world. Each hotel is unique and every stay offers an opportunity to explore local discoveries exclusive to the destination. At Renaissance Hotels, we believe that every guest is a storyteller and we aim to deliver with unexpected experiences meant to be shared. Our signature events in our lobbies, bars & lounges are designed to showcase emerging talent in music, the arts, mixology and culinary and more to inspire new discovery. Renaissance Navigators are neighborhood experts who are ready to assist guests in discovering true local flavors and activities. R.E.N. Meetings offers groups an experience beyond a traditional meeting, rooted in creative sensory meeting design and custom-curated local Navigator excursions and networking events. At Renaissance Hotels, we work to ensure that every trip is transformed into an eye-opening, unforgettable journey. You spend your life working, you should discover the world as you go. To discover more visit www.renhotels.com.